This dining table was commissioned by a couple whose dining room overlooks the Chesapeake Bay in Annapolis, MD. 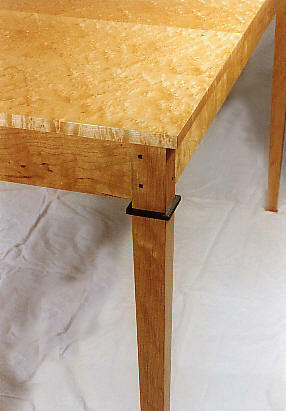 This highly figured Birdseye Maple tabletop sits on square tapered legs of figured cherry. Vermont slate inlays accent the table legs. This dining table opens to accept two leaves.